"A Keyblade that provides an extra boost in Strength and ensures every strike is a critical hit." Make every kind of Ice Cream. 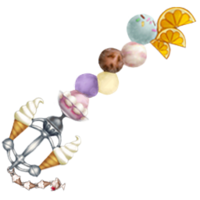 The Sweetstack is a Keychain for Terra's, Ventus's, and Aqua's Keyblades that appears in Kingdom Hearts Birth by Sleep. 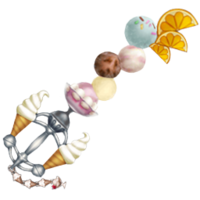 The Sweetstack is a Keyblade designed to look as if it is comprised of multiple scoops of ice cream stacked inside a clear bowl; Terra's version has six scoops, Aqua's has five, and Ventus's has four. The teeth comprise three orange slices splayed out. The hand guard is formed by two soft-serve ice cream cones on either side, connected by several metal ice cream scoopers. The Keychain is made of ice cream cones with a sundae as the token. 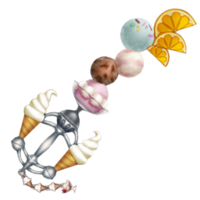 The Sweetstack's name references the typically sweet flavor of ice cream and the stacked scoops of ice cream that make up the Keyblade's shaft. The Keyblade's Japanese name, "Delicious Tower," carries the same meaning.